Sometimes your database needs a little scrubbing. If you are planning to use any variable tags to personalize your database email marketing, having capitalized first and lasts name is key. You probably don't have all day to manually check each of your contacts, but by using this quick Google Sheets hack, your contacts will be capitalized and ready to go in no time. 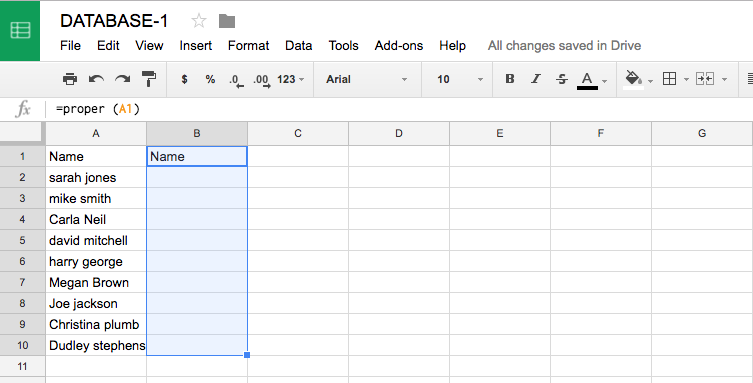 Load your contacts into Google Sheets. If you don't have a GSuite account, you can sign up for one here. You can either import a CSV or Excel file, or copy and paste your data into a new spreadsheet. In the cell at the top of the column next to your data, type "=proper (A1)", and hit enter. You may have to change the A to correspond with the letter that labels your data column. Your first cell should now be repeated in the cell with the formula, but with a capital letter. Hold down shift and at the same time, drag the crosshairs down the entire column next to your data. Release the mouse and release the shift key at the same time. Your data should now fill the next column. Now sit back and marvel at those capitalized names.